Some of us are still reeling from the death this last January of Mark E. Smith, the frontman and acerbic brains behind The Fall, surely one of post-punk’s finest groups, and definitely its longest lasting. The band might not have scored that many Top 40 singles, but Britain’s music press loved and feared Smith in equal amounts. He was always good for a belligerent quote, or a beer-fueled interview down the pub. To paraphrase DJ John Peel, Smith was the yardstick against which other musicians were measured. And his death has also brought out a treasure trove of clippings, including this one from the August 15, 1981 edition of NME. “Portrait of the Artist as a Consumer” was an occasional series, asking musicians for their favorite books, art, writers, comedians, films, and even other music. We’ve pasted the original scan above, but just in case, we’ve transcribed his lists with a little bit of commentary. Of William S. Burroughs much has been written, but Claude Bessy was a French writer who started and/or wrote for several punk fanzines, including Angeleno Dread and Slash, was the resident VJ at Manchester’s Hacienda Club, and directed—supposedly—music videos for The Fall (which ones, I can’t discern). Those who have seen Lewis’ writings for BLAST, the magazine of the vorticist movement in Britain, circa 1914, might be mistaken that they were looking at a M.E.S. lyric sheet. 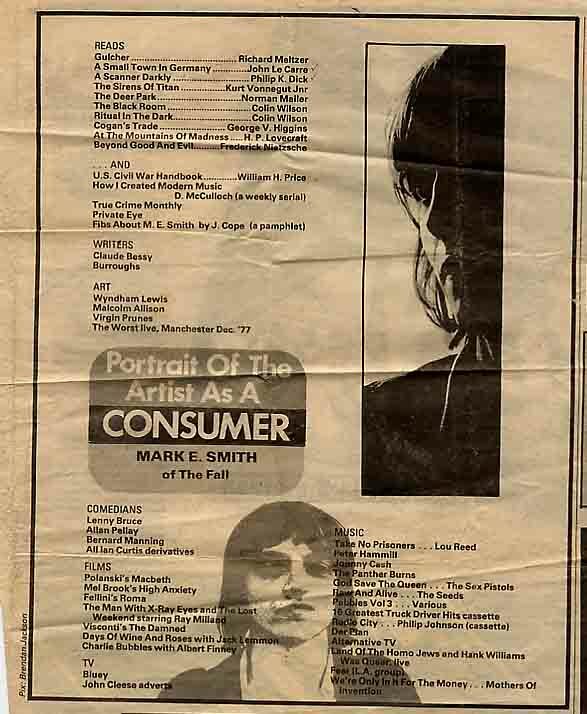 The list is Smith’s joke over what is considered art: Malcolm Allison was an English football player and manager; the Virgin Prunes were an Irish post-punk band; The Worst was a little known punk band that shared the bill with The Fall and John Cooper Clark at the Electric Circus gig—the recording of which was the Fall’s first release. Lenny Bruce and Bernard Manning are opposite ends of a very odd spectrum. More interesting is Alan Pellay aka Al Pellay aka Lana Pellay, who fronted a group I Scream Pleasures that often opened for The Fall, and whose angry declarations over dub tracks by Adrian Sherwood are sonic cousins to Smith. The most personal selection here is the last one, a 1968 film that starred Finney as a desperate but successful writer who returns to his childhood home…Salford, near Manchester, Smith’s own hometown. Of the two, Bluey is the rare one, a cult Australian cop drama from 1976 created by Jock Blair and Ian Jones. We also have no idea why he liked it. So, at last, the music list. No surprises seeing Lou Reed, Johnny Cash, The Pistols, or Zappa on here. The Panther Burns was a favorite group of Claude Bessy; The Seeds was a great garage rock band of the ‘60s; Pebbles is a compilation of American psyche rock; Alternative TV, Fear, and Der Plan had varying degrees of success in the punk and electronic genres. Also Philip Johnson. Radio City was one of a dozen self-released cassettes by an early electronic artist, which DieorDIY described as “A fantastic cut up of various current affairs radio broadcasts, with the classic AM radio sound quality, made good by that cosily depressing ferric oxide degradation technique.” For those looking for the various influences on the genius of Mark E. Smith, this entire list gives you a good place to start. Wonderful to read this, thanks for posting. I reckon D McCulloch will be Sounds journalist Dave rather than Ian of Bunnymen fame. Good point and thanks for the tip. The three seemed so close at one period in time. Let me do some more researching. His serial definitely does not exist, this is pure snark from Smith. Ian McCulloch and Julian Cope are not Mancunians! McCulloch is a Liverpudlian and Cope is from Tamworth in Staffordshire. Andrew is definitely correct about D McCulloch. Also Ian McCulloch and Julian Cope will be surprised to learn they’re from Manchester, not Liverpool. The Dave McCulloch weekly serial “How I Created Modern Music” is, of course, not real, but a reference to McCulloch’s writings in Sounds, which was released weekly. Writers/editors/critics used to often behave as if they were of tantamount importance to the direction of culture. I do not recall if McCulloch was any more prone to this than anyone else of the era, but I remember that Sounds, Melody Maker, and NME would compete to be the first to elevate new artists, or drag down artists championed by the other rags, and would openly boast of their influence. Dave McCullough* was a Sounds writer, known for his pretentiousness and ludicrous stances on current pop music, eg lauding plastic chart pop acts while dissing bands more appreciated by most Sounds readers. Nothing wrong in that by itself, but he did seem to just enjoy being contrary and wordy. *I’m pretty sure that’s the spelling – the use of “McCulloch” was either poor copywriting by the NME or another sly dig at Dave by MES – either is entirely likely. Douglas is right on the spelling – Dave McCullough. He was great, and has remained truer to the spirit of punk than any of them, by completely disappearing, rather than becoming a media pundit. He did go through a “new pop” phase but also championed some of the most underground stuff, including Philip Johnson. He lauded the Fall early on, and was mentioned on the first two LP sleeves. I think Dirker means “paramount”, not “tantamount”. “This is where C. Wilson wrote Ritual in the Dark” (“Deer Park” on “Hex Enduction Hour”). You have to rely on Amazon for your knowledge of him??? I can hear MES cackling from beyond the grave!! !